Wood plastic composite decking as a low-maintenance alternative to traditional deck building materials. wpc decking is made from a mixture of wood and plastic. WPC contains 70% of wood (remains from furniture industry, bamboo) and 30% of polymer (HDPE – High Density Polyethylene). The wood content offers strength and rigidity to the decking, along with better performance in flammability tests. 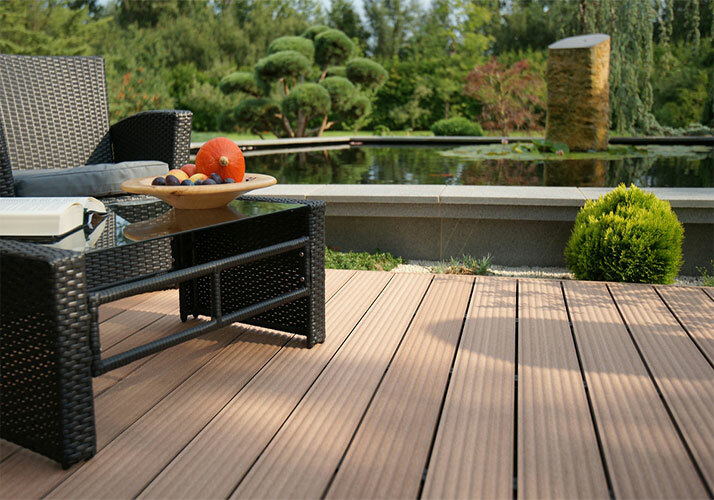 It Won’t Rot — after use many years, wood plastic composite decking will not rot, meanwhile can weather resistance. This is the traditional timber incomparable. It Doesn’t Split — wpc decking will not expand and contracts with heat and especially moisture content in the air. During the course of a year the deck , wood plastic composite decking experiences a large range of stresses from this cycle of heat and cold, wet and dry. Over time , wood plastic composite decking will more durable and strong than ever. No painting or Sealing — Annual water sealing and regular staining is the best way to help protect traditional decking. but wpc decking doesn’t need this protection, you are relieved of your regular maintenance chores and this helps offset the initial cost of the decking. Environment-friendly: wpc decking has certificate, which shows friendly attitude towards tropical forests. At last , wood plastic composite decking material is an attractive alternative to traditional wood, offering less maintenance, long service life and good color retention. wpc decking will result in a beautiful, long-lasting surface underfoot for your interior, exterior porches.